Motor tours by the Autobus Company of Cologne, Germany. Homepage. 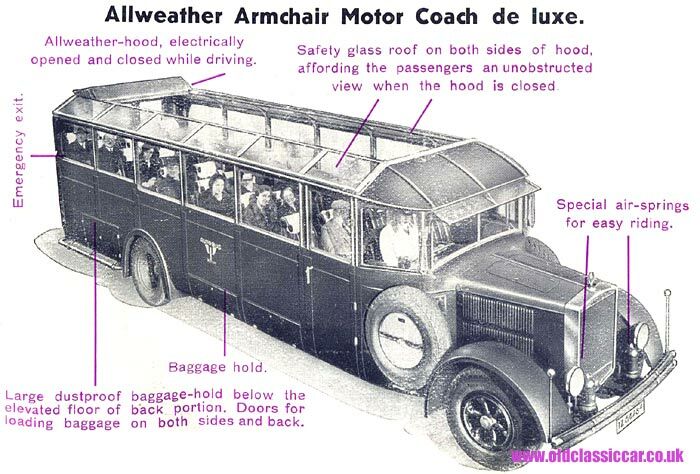 This page: 1934 motor tours of Europe in the Allweather Armchair Motor Coach De Luxe. The Autobus Company Cologne ran "escorted motor tours" during the 1930s, and this booklet, from 1934, describes some of their routes, all centring around Cologne as the main starting point. Day-trips and longer journeys were on offer, with destinations including Dublin, London, Brussels, Paris, Prague and Zurich all featuring on their route itineraries. The cover shows one of their luxurious motor coaches, and a typical Germanic scene, in this case Oberammergau. Printed in English, this booklet was aimed at the UK reader. Inside the front cover there are several tours that all depart from London, whisking the passengers over to Cologne via 3rd class rail and 2nd class steamer, then on from Cologne on board one of the firm's "Allweather Armchair Motor Coach De Luxe" coaches. The shortest tour was an 8-day outing which encompassed a trip around the Rhineland and the Black Forest, for which £12.12.0 would be charged, assuming 2nd class hotel accomodation was required. Upgrade to 1st class lodgings and the price would rise to £13.13.0. The lengthiest trip was a 15-day tour that visited the Rhineland, meandered over the Bavarian Alps, took in the Austrian Tyrol, the Black Forest and finally Oberammergau in time for a visit to the Passion Play, for which tickets were included in the basic price of £36.15.0 (low season, 2nd class accomodation). 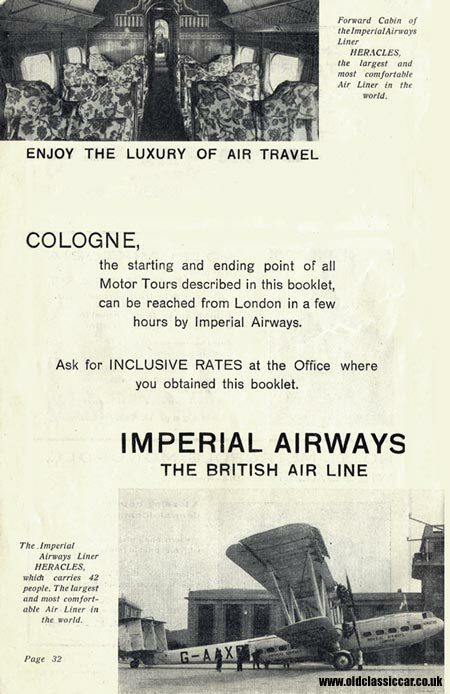 Fly to Cologne by Imperial Airways aircraft. Some tours included a steamer trip from Dover to Ostend, and others Harwich to Flushing. 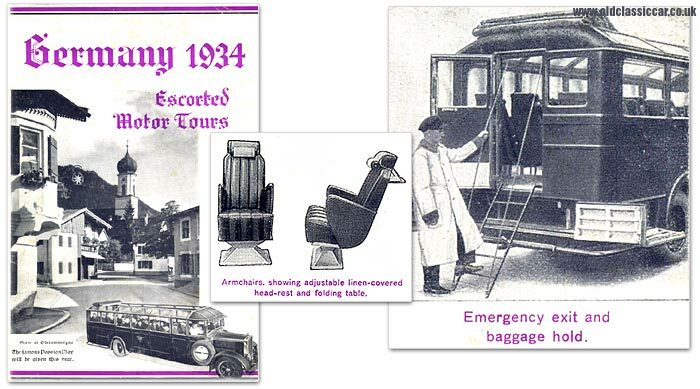 Air travel was another option, if funds allowed and you wished to enjoy a flight with Imperial Airways before connecting with the Autobus Company's coach. The last but one page is given over to an advertisement for Imperial Airways, which was the forerunner to what we know call British Airways. There is a photograph of Imperial Airways' Horatius aircraft, "the largest and most comfortable Air Liner in the world". Capable of carrying up to 42 passengers, Imperial's mighty propeller-driven aircraft were truly luxurious machines, at a time when air travel was the preserve of the few and something to aspire to, with thoughts of full-body scanners and other invasive formalities still many decades away. The aircraft shown, G-AAXD, was a Handley Page HP.45 biplane airliner, one of eight HP.42 / 45 airliners that the company flew. G-AAXD, named Horatius, features in the advertisement although the text of the ad refers to Heracles, a sister aircraft (regn G-AAXC). Designed for European operations, the HP.45 was powered by four Bristol Jupiter XFBM supercharged engines. The type flew it's first commercial passenger-carrying flight in June 1931, and continued in service until September 1939 after which they served, albeit briefly, with the RAF during the early months of WW2. G-AAXD first flew on 6th November 1931. In September 1938 it suffered a forced landing, but was repairable and returned to service with Imperial Airways. On the 7th November 1939, while returning from France in service with the British Expeditionary Force, it ran into poor weather conditions and ended up crash-landing on Tiverton Golf Course, writing it off. The Motor Coach De Luxe used by this Cologne-based tour firm. These swish-looking motorbuses were used on the company's long-distance tours, and must have been quite a sight and a pleasure to ride in. Electrically-opened and closed "Allweather" hood fitted to the coach's roof. Emergency rear exit door, with steps. Angled safety glass rooflights fitted alongside the opening roof section, affording maximum visibility. Does anyone recognise the make of chassis shown above, or the coachbuilder responsible for this luxurious creation? To get an idea of comparable services offered in England prior to the war, have a look at this 1930's guide to United Motor Services tours for private parties.